As an HR professional, you know how complex annual compensation planning is. You also know that organizing your data and understanding your desired outcomes are the keys to success. Want to make it a little easier this year? This step-by-step guide to compensation planning will give you the confidence and guidance needed to start off right. 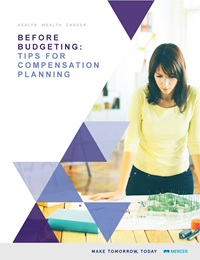 Download the best practices white paper, Before Budgeting: Tips for Compensation Planning. At Mercer, we make a difference in the lives of more than 110 million people every day by advancing their health, wealth, and careers. Mercer Career Products is a leading provider of compensation and benefits information, created from one of the largest warehouses of employer-reported data. Our data spans the globe and crosses most industries, providing you with robust, relevant data for all of your compensation, benefits, and employee mobility needs.